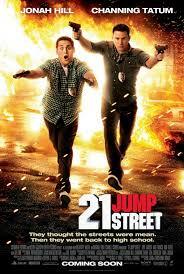 Two young and hopeless cops get assigned to the Jump Street department that send cops undercover into schools. Trying to bust a drug ring, geeky Schmidt (Jonah Hill) and jock Kenko (Channing Tatum) find themselves getting in too deep and having to go to ridiculous lengths to get the job down. I accidentally saw half of this (the second half) a while ago and thought it looked terrible. It doesn’t help that I grew up on the original television show with Johnny Depp and was suspicious that this film would ruin the integrity of the original. Even having recently watched the original and realised that what I thought was brilliant television was actually pretty average. And even with a brief cameo from Johnny and his mate Peter DeLuise, I couldn’t bear giving it another try. How wrong I was! This is a really fun film. Stupid, ridiculous and unbelievable, but also totally aware of this. There were elements of this that reminded me of The Heat with Sandra Bullock and Melissa McCarthy – silly action, hilarious banter, just good old fun times.